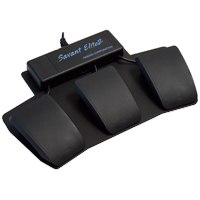 The Savant Elite2 Triple Action Foot Pedal is preprogrammed with Left, Right and Double mouse clicks, enabling users to offload the three most common mouse actions to one or both feet. The standard model features three foot pedals secured to a solid steel base which serves well for users who wish to pivot their foot from the heel for activation of the pedals. 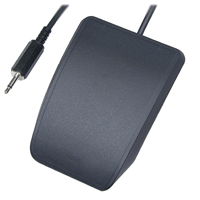 The FP30AJ model includes an additional input jack which enables the connection of another stand-alone foot pedal or other switch equipped with a 0.125" mini-phono plug. 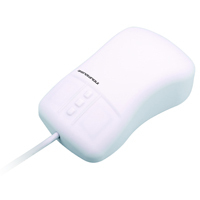 This can enable a user to locate the third switch remotely for access by the other foot (or hand) or it can be positioned adjacent to the primary pedals. See our range of switches in the Switches category. 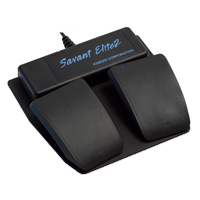 The Savant Elite2 Dual Action Foot Pedal is an ideal option for a user who wishes to have an alternate clicking solution. 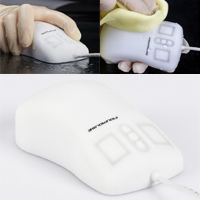 Preprogrammed with Left and Right mouse clicks, the Dual Action Foot Pedal enables users to offload the most common mouse actions to one or both feet. The standard model features two foot pedals secured to a solid steel base which serves well for users who wish to pivot their foot from the heel when moving between pedals. The FP20AJ model includes an additional input jack which enables the connection of another stand-alone foot pedal or other switch equipped with a 0.125" mini-phono plug. This can enable a user to locate the third switch remotely for access by the other foot (or hand) or it can be positioned adjacent to the primary pedals. See our range of switches in the Switches category.